Any fellow motorcycle riders out there? If you are or not, this is a picture during the first week of August when every year for the last 73 years, a motorcycle rally has been held in the small town of Sturgis. This is also the birthplace for the reality TV show that some of you may be familiar with, Full Throttle Saloon. I’m not really sure when it happened, but my dad, my sister, and I decided to take a trip out to Sturgis, South Dakota in August of 2012. My dad frequents motorcycle rallies all over the country, so this was no new adventure for him. For my sister and I though, it was a brand new experience. The only other rally we had visited was down south by the ocean, so a rally in the mountains seemed thrilling. And that it was! Some people choose to ride their motorcycles all the way to South Dakota. For them, that is a part of the tradition. Unfortunately, that was not an option for us. So, we loaded the bikes in the trailer and hit the road. It was like any other road trip that takes place from one side of the country to the other—long and irritating, yet somehow one of the best parts of our trip. Ah, there‘s just something about being crammed in a car with your family for twenty hours straight. With every hour we were closer to our destination. For those of you who have never been to the Northwest, I will note that the scenery is absolutely beautiful. Once we finally made it and got settled into our room, it was time to explore! Everyone has their niche in life; that one thing that they enjoy doing and ours just so happens to be riding motorcycles. While we road through all the mountains, taking in the stunning landscapes, I couldn’t think of anything other than the peace I felt. There is something totally freeing about riding a motorcycle. It’s just you and your bike and the open road. Well technically it wasn’t just us. We were sharing the roads with about 200,000 other bikers believe it or not. With this rally being almost a century old, it attracts more riders than multiple other rallies put together. Every rally across the country has something unique to offer motorcycle enthusiasts. That’s why those places are chosen specifically I suppose. Something they all have in common is that if you enjoy a good party, you will fit right in. 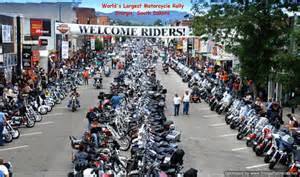 But, in Sturgis the most significant thing is the rides that the surrounding cities offer. The set up of other rallies usually are set up in the city’s downtown area and the norm is to ride around that town. In Sturgis the outer cities offer captivating rides on open roads that take you through mountain majesties and allow you experience the beauty of this country in a way you aren’t able to at other rallies. Some of the surrounding towns worth mentioning include the city of Aladdin, which normally only has a population in the single digits. This place is the definition of a small town which is flooded with bikers visiting the only building in the town which serves as not only an antique shop, but also the local post office, gas station, and supermarket. Other top places to visit in the area while on two wheels are Mount Rushmore and Deadwood. 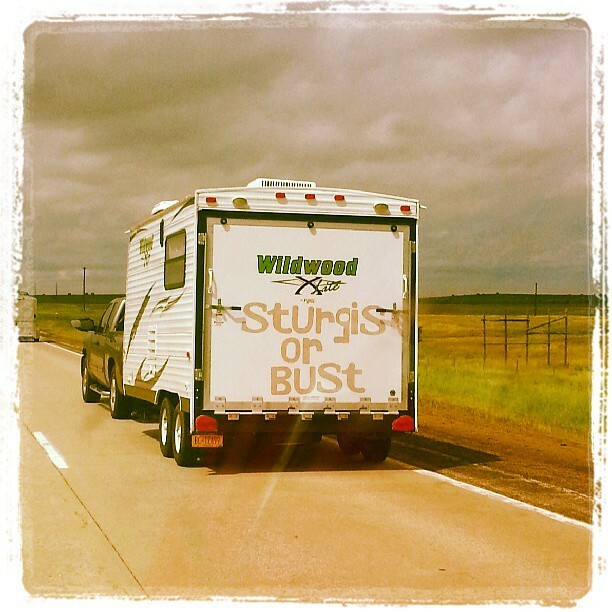 Each nearby town offers something special to your trip to the Sturgis rally. If you ever get the chance to go that way I recommend you do it. It’s not every day you get to be surrounded by breathtaking landscapes. As for my dad, sister and I, we have made it a tradition every year. Be safe and ride on! Previous Post: « Is The Threat Of Wrinkles Scaring You?